rec. 27-29 January 2014, Studio 1, Radio Zurich. Paul Juon was born in Moscow of Swiss parents and returned to Switzerland in 1934. CPO have almost cornered the market in his chamber music. Gary Higginson liked their CDs of Juon's Piano Quintet and Piano Sextet (review) and of his two Piano Quartets (review). More recently I reviewed a Swiss MGB disc of his sets of winning miniatures which are unusually laid out for two violins and piano (review). The Sarastro Quartett give these four melodious yet forgotten quartets a fair and following wind. They play with a warmth and conviction that defies the very unfamiliarity of these works. This music is buttressed by melody and its language is largely cast in late-romantic terms. The big First Quartet, lasting not far short of three-quarters of an hour, was written, so we are told by liner-note writer Eckhardt van den Hoogen, after the Op. 11 work. It is substantial and seriously-intended. Bustling and singing full-heartedly it constantly invokes the shades of Smetana, Dvorak and Schubert. The quartet is in five movements unlike the other three which are each in four. I find nothing in this case that feels Russian. The Op. 11 Second Quartet is dedicated to the Bohemian String Quartet "in heartfelt admiration". This more economically expressed work has a very calming second movement. The tempo-mood marking - Andante Tranquillo - is spot-on. The finale has a Russian dancing exuberance about it but tempered with a Grieg-like sweetness. Like the First Quartet this work speaks of all the genial temperaments whether in still-life or in athletic activity. The second disc introduces us to the Third Quartet which was written four years into the new century. The Sarastro gives the first movement a fast-ticking mechanism contrasted with flecks of poignant nostalgia redolent of Howells' pre-war chamber music. For the first time in the Lento Assai (II) Juon introduces distorting mirrors that fragment the progress of the music: signs of expressionism. A gracious step-and-halt country-dance puts in an appearance in III which has some most intriguing sentimental touches which do not halt forward motion. The final Lento assai - Vivace non troppo at first limps along in uncertainty. It seems querulous yet Juon soon lets us off with a quick-paced folk dance which has moments for smiling recollections of the bustle of the first two quartets. I have mentioned Howells already but I am quite sure that open-minded admirers of Vaughan Williams' two string quartets will also enjoy this work. The Fourth Quartet dates from two years after the Great War. There's no huge upheaval in Juon's style. His undulating and surging music in the first movement is very touching and there's no resort to dissonance. Towards the end of the movement we may think of Korngold's string quartets. The strikingly fragile and pastoral Andante is followed by an Allegretto that dances prettily along in dolly finery. Juon reserves more brusque and Ravel-like ideas for the long finale. The liner-note, in German and English, covers all the bases but the parts concerned with the quartets can be hard-going. The booklet includes music examples. It's a shame that the rear insert of the jewel case does not include the keys and dates for each work. The recording is unapologetically direct but allows the listener an agreeable and well-judged distance from the players. 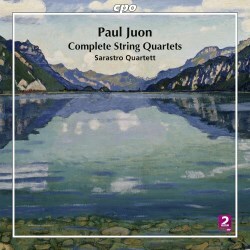 Juon's four string quartets make a very welcome appearance and these performances and recordings will help carve out a place for this fine and barely known composer.